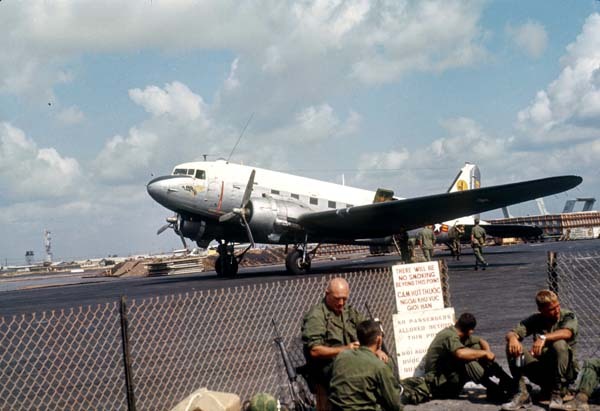 Many types of aircraft used Tay Ninh airport but they were primarily painted green or camouflage. Few identifying marks make it likely the Special Forces or CIA operated this airplane. This primitive airport was busy day and night with propeller driven fixed wing planes and helicopters. The passenger waiting area has 4 troopers but at other times was packed like a sardine tin. Their uniforms look like those of men with time in the field. A distant look in the eyes and nonconforming uniforms were a sure sign identifying field soldiers. In our area clay laterite soil stained the cloth part of our jungle boots red as we walked and its dust covered everything during the dry season. Soldiers in base camp avoided this soil and stain if they could. Thomas Johnson identified this as a VNAF C-47.